The year is 2056 and an army of evil space aliens is plundering the earth. Luckily, a hero has come forward: a hero of power, of stature, of pure meteoric strength. A Mighty Rodent is here! Fluffles and his latest micro-high-tech weaponry through a meat grinder of flying saucers, giant robots and laser-wielding behemoths intent on frying his fur. 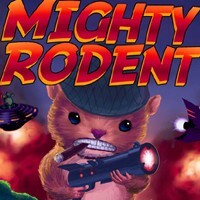 You'll have an arsenal of amazing rodent weaponry at your disposal to defeat an armada of gargantuan bosses on your road to victory! query: INSERT INTO accesslog (title, path, url, hostname, uid, timestamp) values('Mighty Rodent', 'node/1212', '', '3.80.224.52', 0, 1556146031) in /home/surelion/public_html/drupal-4.6/includes/database.mysql.inc on line 66.